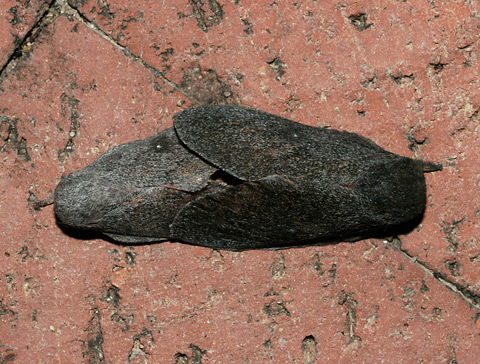 This strange, oblong, dark gray blob below is actually two mating Hubbard's Silkmoths (Sphingicampa hubbardi). I discovered this pair of Hubbard's Silkmoths on my front patio one morning in mid-September of 2006. These normally nocturnal moths somehow hadn't managed to finish mating before the sun came up. Adult Hubbard's Silkmoths emerge in the summer and early fall, and since they don't eat, mating is their first and only priority. Male and female Hubbard's Silkmoths are similar in appearance, but females are noticeably larger. Their forewings and the front half of their plump bodies are a fuzzy, dark charcoal gray, while their sometimes concealed hindwings and abdomen are pink. I gently teased open the wings of the larger female to get a look at her pink hindwings. 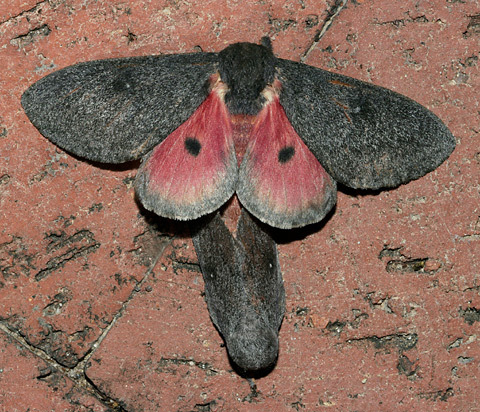 Each pink hindwing is broadly edged in dark gray and has a large, black dot in the center. The forewings each also have a large, central dot, but these forewing dots are a less distinct shade of darker gray and have a tiny, whitish spot at their center. After taking this photo, I moved the female Hubbard's Silkmoth's wings back over her hindwings to return the mating pair back to their camouflaged gray blob appearance that was less likely to be noticed by a hungry bird. After mating, female Hubbard's Silkmoths will lay their eggs on Acacia (Acacia spp.) or Mesquite (Prosopis spp.) trees. Hubbard's Silkmoths are relatively large, the females have about a 3 inch (7.6 cm) wingspan, so it's not surprising that their caterpillars are also large. The plump Hubbard's Silkmoth caterpillars are green with a whitish stripe along the sides and "horns" on the back. Despite their dramatic appearance, these caterpillars are rather difficult to spot amidst the foliage, and I've never seen one.